In conjunction with the official launch of Rochester Institute of Technology’s MAGIC Spell Studios, RIT’s Center for Media, Arts, Games, Interaction and Creativity presents a free talk by local video-game developers and entrepreneurs Karthik and Guha Bala from 4 to 5:30 p.m. Monday, Nov. 14, in RIT’s Student Innovation Hall. 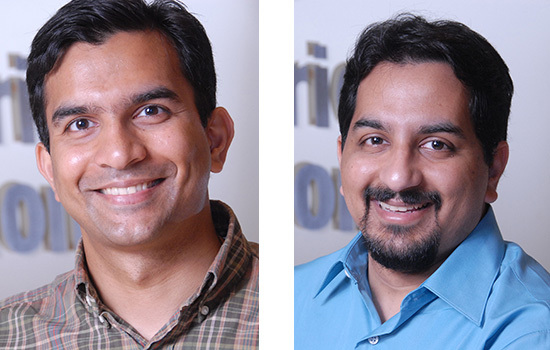 The Bala brothers are founders of Velan Ventures, an innovation investment company that supports entrepreneurs and early-stage startups with strategy, financing and management to bring video games and related technologies from proof-of-concept to market. The Rochester, N.Y., natives are perhaps most widely known for co-founding Vicarious Visions in 1991 while they were in high school. Under their direction, Vicarious Visions grew to become an industry-leading game development company, helping to shape popular culture around the world. Vicarious Visions has developed and grown multi-billion dollar franchises such as Skylanders, Guitar Hero, Tony Hawk and more. In addition, the company’s games have garnered critical acclaim including the prestigious British Academy of Film and Television Arts (BAFTA) awards, Nickelodeon Parent’s Choice award and numerous Game of the Year awards. Vicarious Visions was acquired by video game publisher Activision/Blizzard in 2005. Karthik Bala earned degrees in computer science and psychology from Rensselaer Polytechnic Institute. Guha Bala earned his honors degree in chemistry from Harvard University. Both brothers earned MBA degrees from the MIT Sloan School of Management. They were honored as Rensselaer Polytechnic Institute’s “Entrepreneurs of the Year” in 2013. On Tuesday, Nov. 15, RIT’s MAGIC Spell Studios will officially celebrate its launch with an invitation-only event in RIT’s Student Innovation Hall. RIT’s MAGIC Spell Studios, a university program that will link the university’s internationally ranked academic programs with high-tech facilities needed to commercialize computer gaming, film and animation, and graphic design projects, is a first-of-its kind effort in higher education. The 43,000-square-foot building, which will house MAGIC Spell Studios, is scheduled to open fall 2018.